Hayao Miyazaki at the 2009 San Diego Comic-Con. Hayao Miyazaki (宮崎 駿, Miyazaki Hayao, born Januar 5, 1941) is a Japanese film director, animator, manga airtist, illustrator, producer, an screenwriter. Through a career that haes spanned sax decades, Miyazaki haes attained internaitional acclaim as a maker o anime featur films an, alang wi Isao Takahata, co-foondit Studio Ghibli, a film an animation studio. 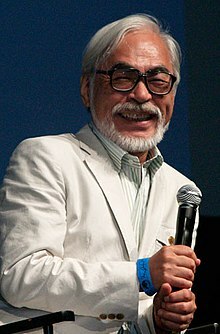 The success o Miyazaki's films haes invited comparisons wi American animator Walt Disney, Breetish animator Nick Park, an American director Steven Spielberg. ↑ Feldman, Steven (1994-06-24). "Hayao Miyazaki Biography" (plain text) (Revision 2 ed.). Nausicaa.net. Retrieved 2007-02-19. ↑ Morrison, Tim (2006-11-13). "Hayao Miyazaki: In an era of high-tech wizardry, the anime auteur makes magic the old way". Time Asia. Archived frae the oreeginal on 2011-06-23. Retrieved 2007-02-19.